Loyd Henion, seeking better treatment of Pacific islanders in Oregon. Pacific islanders bore the brunt of nuclear weapons testing by the United States half a century ago, and like the Navy veterans who took part, some are still suffering bad health as a result. We owe them, and we should treat them better than we do. Loyd Henion is one man fighting on their behalf. A North Albany resident, Henion is a retired economist for the state transportation department and has been chairman of the Linn County Democratic Central Committee for several years. On Tuesday I ran into him in the House office wing of the Capitol in Salem. 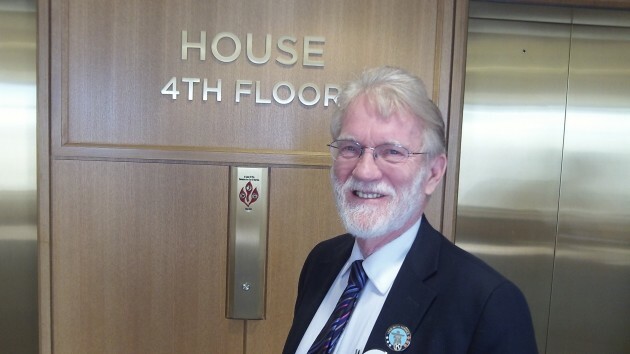 He was hoping to talk with legislators in favor of House Bill 2522, which would set up an office in the Oregon Health Authority whose job it would be to “promote access to health care” for people living in Oregon who are citizens of the Marshall Islands, Palau or Micronesia. After the Second World War the United States conducted dozens of atomic bomb tests in part of that region. Its citizens now can live in the United States because their island nations are under “compacts of free association” (COFA) with the U.S., but they are treated as aliens and not entitled to certain benefits even though they are required to pay state and federal taxes. Generic Levitra and interactions at http://www.noc2healthcare.com/levitra-generic/ reliable information. For example, they had been denied regular driver’s licenses until the legislature, at Henion’s urging, fixed this in 2013. Now his quest is to make the islanders eligible for health care under Medicaid. Hence the bill, even though in my reading it doesn’t go much further than establishing an office in the state bureaucracy. Seems like the bill would be stronger it it simply declared Oregon residents of the COFA nations to be eligible for all programs available to other Oregonians. Henion became aware of issues affecting these people when he hired a woman from the Marshall Islands as a caregiver for his aging mother. Radiation levels in the islands are still high and people suffer from rates of cancer, birth defects and chronic illnesses blamed on atomic testing. The U.S.still has significant economic control over the islands, so the welfare of their populations is still our responsibility. Interesting about the drivers licenses, since ILLEGAL ALIENS can receive them with the state’s blessing! This article states they were denied “regular” drivers licenses. What kind of drivers licenses were they issued? That may be a non issue.